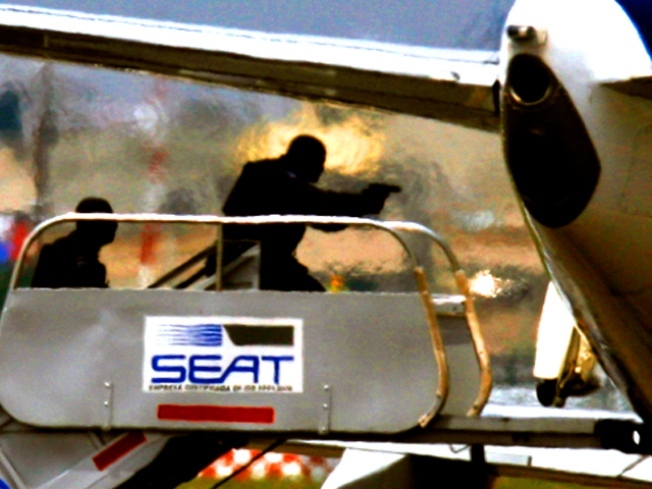 Mexican police enter a hijacked Aeromexico plane sitting on the tarmac at Mexico City's international airport. A bible-toting Bolivian religious fanatic was the lone hijacker of a Mexican airplane who told authorities he seized the jet after receiving a divine revelation of an impending earthquake, officials said. Jose Mar Flores, 44, told Mexican police that today's date -- 9/9/09 -- was the satanic number 666 turned upside down and that he was trying to warn Mexican President Felipe Calderon of a coming natural disaster when he hijacked the Aeromexico jet in Cancun. After using a fake bomb to hijack the jet, he ordered the pilot to circle over Mexico City seven times before landing at an airport where the 112 passengers and crew on board were quickly freed. There was no bomb found on the aircraft. Mexican police stormed the plane and were able to arrest the suspect -- along with seven others whose roles were unknown -- without firing a single shot, officials said. Police later said Flores acted alone. A female passenger on the Boeing 737 said she saw one man involved in the take-over and that those on board didn't know the plane had been hijacked until they saw police approach the aircraft in Mexico City. Another passenger, Daniel Hernandez, said he saw Flores carrying a Bible. "He never yelled at us or made threats," Adriana Romero, the passenger, said. Aeromexico Flight 576 left from Cancun, Mexico, earlier today and was being held on the runway at Mexico City's international airport. It carried U.S., French and Mexican citizens, officials said.